The mountains that tower above the Birch River weather the brunt of winter storms that sweep east across central West Virginia, and it was here on a November night that one of the great battles between man and nature was fought. As winter comes on, I often consider the tale of Bill Barnett and the bear. Though his legend has grown obscure, he was a folk hero in the hills where Braxton and Nicholas counties join and was known far and wide for many years as ‘the greatest of the bear hunters.’ I cannot determine when he lived and when he died, though I guess that he saw the Civil War, though I’ve not found a record of his enlistment. Chances are he was already an old man by the time of the conflict, though I hope to find out more. What follows is an amended text featured in the 1976 West Virginia Heritage Encyclopedia, though I’ve found other versions of the tale, perhaps not so full of detail. But a tale such as this deserves detail and the encyclopedia’s editor, Jim Comstock, was never shy about making sure there was plenty to be had. “People in that area say that on one occasion in November he went hunting with his muzzle-loading rifle and his dog, Bounce. After walking half the day, he reached a rocky hill on which unmistakable signs of bear could be detected. It was not long before the bear appeared, and immediately the big, black animal received a charge from Barnett’s muzzle-loader. Then the dog was upon it, and a fierce, if uneven, fight ensued. “Perhaps because he didn’t want to hit the dog, his second shot went wild, and he determined to attack with his knife. He had to do something or his dog would have been killed, so without a second thought he waded into the fray. As the three rolled about on the ground, Bill slashed again and again with his knife, and the bear gnashed back with his teeth. 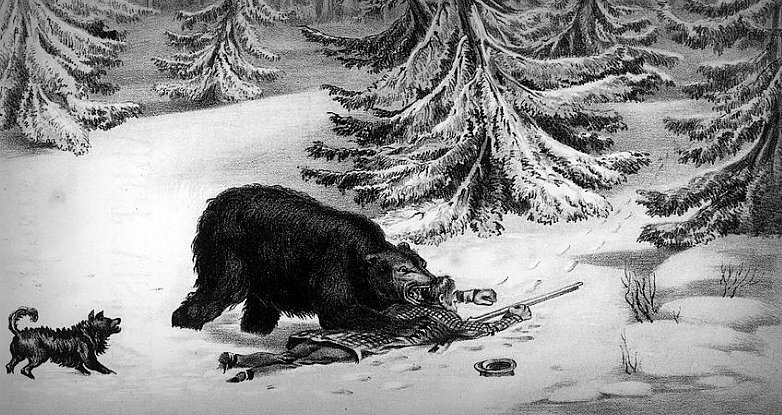 “After an hour or more of fighting, the bear suddenly came down on the hunter’s chest, and as he did so, Bill caught him by the scruff of the neck and hacked with his knife until he was able to pierce the animal’s brain. Dead at last, the bear rolled down the hill, and, later, people found that it had grabbed at rocks with its teeth while rolling and bit them in two. After resting momentarily, Bill tried to rise to go to the bear but found that one leg could not be used. Crawling on his hands and one knee, he got down to the dead monster and gutted him. Then he took a piece of bloody cloth, tied it to the neck of the dog, and sent it home. His only hope was that Bounce would get to civilization and bring back help. “It was not long afterwards that Bounce reached the house where Mrs. Barnett was fixing dinner. She ran from one neighbor to another, and soon a party was made up to search for the wounded man. The dog attempted to lead them, but it was so exhausted that it soon was unable to go on. That evening the search party returned without its man. They had not been able to find him. “Meanwhile, Bill had cut himself a crutch and tried to walk out, but he was in such pain that he finally returned to the carcass of the bear and lay down on it for its softness and warmth. Snow began to fall, so by using some gunpowder, he managed, painfully, to make a fire. Within several hours, however, a fever had set in, and he had a powerful thirst which he could not quench with moisture from the dead leaves. He felt sure that he would not live until morning. “It was in that condition that he was found by Morgan Baughman, who went off in search of Barnett after returning with the unsuccessful search party. Reaching the half-dead man, he brought him a drink of water from the creek in his boot. It was the best drink Bill Barnett had ever had. Powell Mountain goat beloved inhabitant of central W.Va. Pedal train excursion lead riders into remote central W.Va.